Why it’s so tricky for geologists to think about climate change. Geologists who think about climate change have to reconcile their field’s long-term view with their own short-term lives. It used to be one big snowball. The first thing I learned in my introductory geology course was the age of the Earth: 4.54 billion years. Relatively speaking, then, the whole of human history is happening in the geological blink of an eye. Now, as I enter my second year of graduate school, I have come to find that geologists inhabit a sparsely populated plane of thought located between very long-term empirical science, and our place as humans in the present. Geologists, by definition, study the history and evolution of the Earth (among other things), and so we tend to think and work on very long time scales—up to billions of years. We conduct research from a geocentric rather than an anthropocentric perspective. 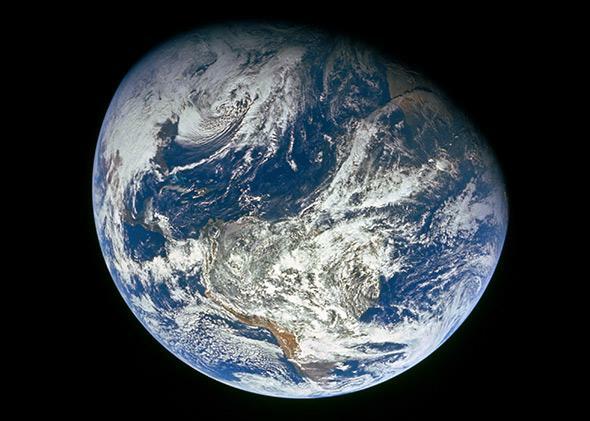 We look at how conditions on, and the condition of, the Earth have changed over time. This point of view allows us to possess ultimate objectivity on controversial issues like hydraulic fracturing, earthquake and tsunami preparedness, and climate change. At what point, though, do we draw the line between addressing a topic as purely scientists and engaging with it as affected people? When should we shift from examining how the Earth itself is changing, to investigating how changing conditions are affecting us as humans? Climate change offers a prime example of the time-scale duality for a geologist. This tension is especially acute for me, because my personal research focuses on changes in past global sea level. The issues are all tangled up: How do we balance the way climate change affects the planet and how it affects humans? Should we call it “anthropogenic” (or man-made) climate change? On what time scale we should examine it? That last question is particularly thorny: Geologists are the leading group behind the science that provides evidence of anthropogenic effects on the carbon dioxide levels in the atmosphere—which is a relatively short-term phenomenon (approximately 150 years)—but we traditionally operate on much longer time scales. So, here is the geologists’ truth: In the long run, the Earth will be fine. One could make the argument that the climate is always changing, which it technically is. Throughout the entire 4.54- billion-year history of the Earth, it has gone from having no oxygen at all to having enough to sustain huge life forms like the dinosaurs; from a time when it was completely covered in ice like a “snowball” to a time when Antarctica was tree-covered and warm; and all sorts of other huge swings prior to today. Current atmospheric carbon dioxide levels—though they are at a record high on human time scales, and have been increasing exponentially since we began industrialization—are extremely low compared with most of Earth’s history. The planet has undergone all of these very dramatic global climate changes, and life has survived, thrived even, after each one. The remaining life forms, though, are not always the dominant species of the time (i.e. the dinosaurs did not survive). Even today we continue to lose species to extinction—and humans are often the culprit. The Earth has another few billion years left before the aging sun will make it too hot for life, and by that time any consequences of anthropogenic climate change will have had ample time to be “reset” for whatever life forms survived our reign. But geologists are humans, too—some of us are even humans with beach homes on the coast. I currently live in Florida, where sea- level rise is a very relevant topic. Our coasts are already seeing the effects in the form of extreme tides and detrimental storm surges. Importantly, Florida itself was completely underwater for almost 100 million years, and it was during that time that the porous, carbonate platform we call home was slowly formed. Florida as a land mass and the ocean critters that live around it, then, would be completely content if it were fully submerged. Only we, the people who have just recently decided to live on its edges, are unhappy with the idea. On human time scales, we are changing the climate and making it more difficult for us to live here. Rising sea level is and will decrease habitable living space and limit the amount of freshwater available to coastal communities. Increased fossil fuels in the atmosphere have proven detrimental health effects; rising temperatures cause irreversible damage to ecosystems. The list goes on. It’s easy for geologists to have a long-term view of climate change and feel that everything will work out in the end, but on the other hand we have kids and grandkids who will inherit a more inhospitable Earth because of what humans are doing. How many years of increased temperatures and decreased air quality have we already committed them to? Part of the problem on acting on climate change is that the general public has the view that climate change isn’t something that is affecting them right now—even though there is air quality and sea level data to refute that. In some ways I, as a geologist, can empathize with people of this view point because they are right—climate change is a long-term phenomenon. Anthropogenic climate change, though, is most certainly a recent occurrence. Regardless of discrepancies in causality, we are all facing the same reality of the consequences right now. So there is this overall problem of scale. On what timeline should we think about and act on climate change? I believe it is right to plan for the future and try to limit emissions as much as possible, and geologists—climate scientists—will be the first people to advocate for that as well. But I think a little long-term perspective is useful, and perhaps it’s vitally humbling to consider that our actions, ultimately, aren’t hurting the Earth, but hurting us the fragile ecosystems that live here, including us.